Do you like family picnic? What will you bring for a picnic? 1）It is sunny today. My family and I are going on a picnic❶ near the lake. food. My dog Rover is with us，too. She is making a salad. 3）I'm putting the food and drinks on a tablecloth. There are lots of fruits and vegetables for us. ❸ I have some cookies for Rover，too. eg：They will go on a picnic on Sunday. eg：The boy is strong enough to carry the box. Please bring your homework here. A Family PicnicPPT，第四部分内容：Let's Do It ! 1) Listen and number the pictures. 2) Read the lesson and match the people with the actions. 3) Work in pairs. 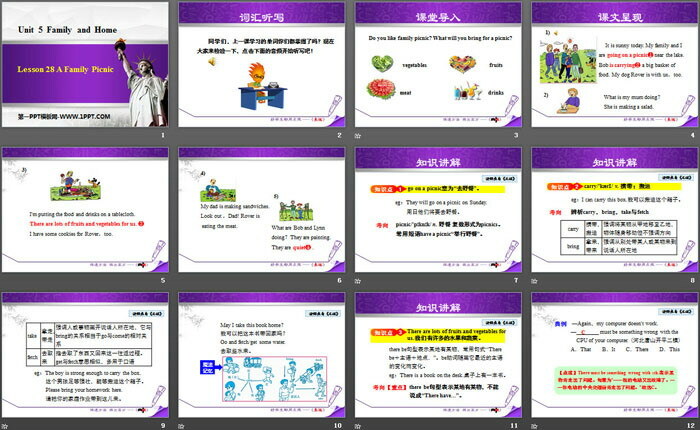 Look at the pictures in this lesson. What are Jenny and her family doing？Talk about it. A：What is Jenny's mother doing? B：She is making a salad. B：She is putting things on a tablecloth. 3. It's good for us to drink ______ water every day. 8. There are _______ books on the bookshelf(书架). 9. The old man likes to live in a _______ village(村庄). 10. Tom wants _________ the heavy box to his office. 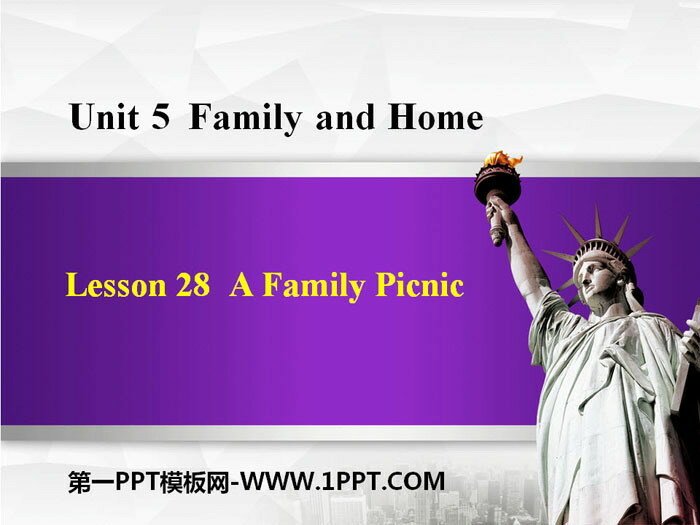 《A Family Picnic》Family and Home PPT 课件下载 第一部分内容：Lead-in Lets go for a picnic! What do we need for a picnic? What will you bring for a picnic? ... ... ... A ..
《A Family Picnic》Family and Home PPT下载 第一部分内容：温故互查 Make up a dialogue like the following: A : What are you doing? B : I am +V-ing . A: What is he/she doing..
《A Family Picnic》Family and Home PPT课件 第一部分内容：教材原文 1 It is sunny today. ①My family and I are going on a picnic near the lake. ②Bob is carrying a big bask..